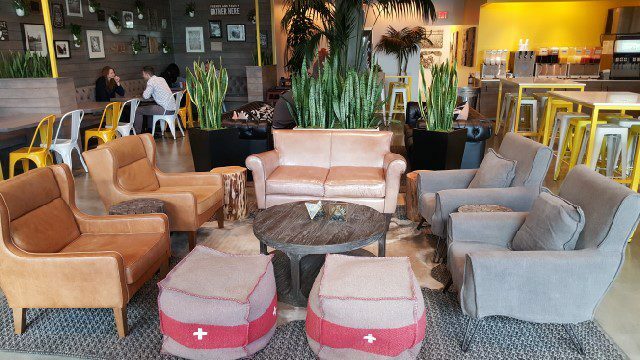 Seating is available at tables but the lounge chairs are rather eye catching, especially on a lazy Sunday morning. Open for breakfast and lunch, the one question you have to ask yourself when you go is whether you want chicken or an egg, or both. 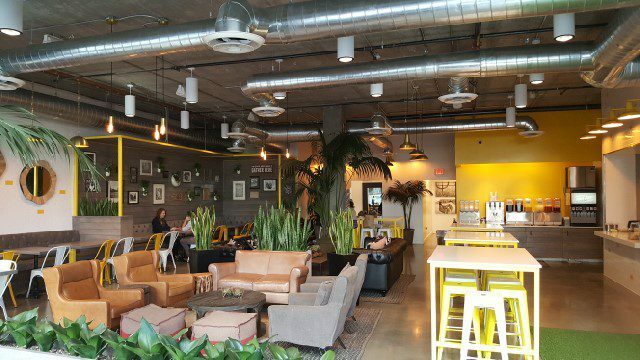 The menu features only organic, farm-sourced chicken and eggs from trusted California purveyors. The egg menu offers many classic brunch dishes – bacon, egg & cheese, steak & eggs, sausage & egg and Benedict’s Brother Harold (a play on an egg’s Benedict). We enjoyed the Smoked Salmon & Avocado Toast. 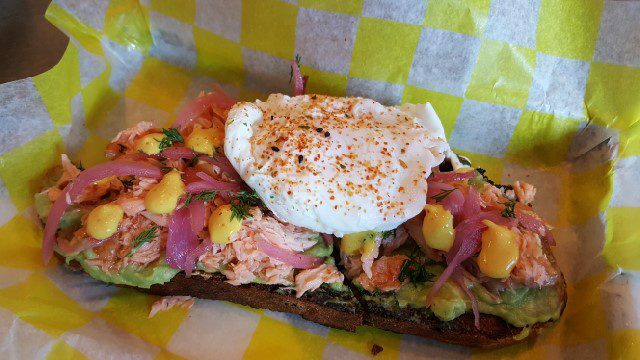 Fresh king salmon and avocado are served on whole wheat toast and topped with pickled onion, vegan tumeric hollandaise and a poached organic cage-free egg. Smoked salmon is a typical brunch item but I had never had it on avocado toast. The creaminess of the avocado and smokiness of the salmon worked well together. In the chicken section, there are five chicken sandwich options as well as three salad choices. 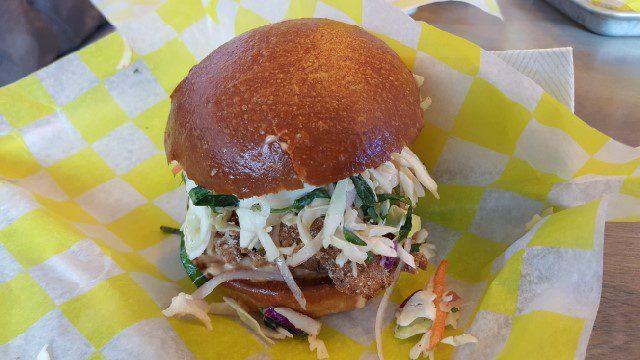 Perhaps it was because of the name, but we selected The Reason The Road Was Crossed, a crispy organic free-range chicken, honey sriracha remoulade and radish-cabbage slaw on a brioche. I loved the crunch of the crispy chicken but you can also substitute it for grilled organic free-range chicken instead. The Chicken or The Egg also offers a Crispy Chicken Bucket with either two pieces or four pieces of boneless chicken. The crispy chicken is very crispy on the outside but still tender meat inside. It is also gluten free. 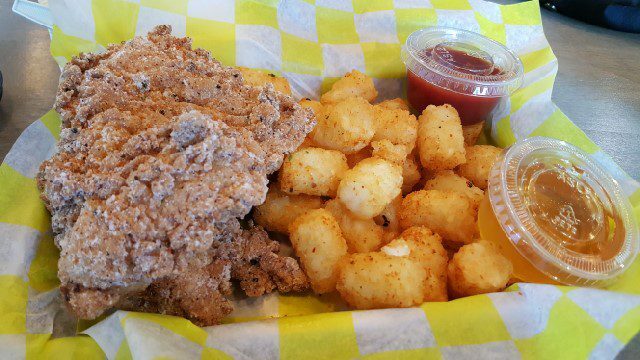 It comes with a choice of sides and the spicy tater tots definitely have a kick. The sides on the menu are the only items that do not have chicken or egg in them. 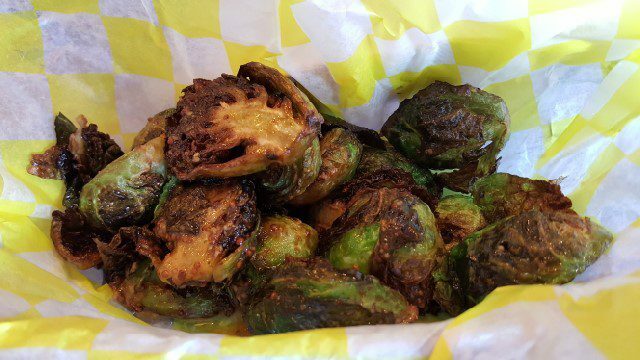 The Maple Brussel Sprouts are big pieces of roasted brussel sprouts with a sweet glaze. 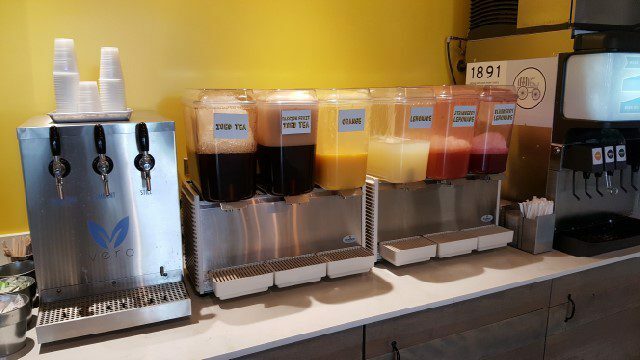 To drink, The Chicken or the Egg offers a variety of iced teas, lemonades and juices. But for Sunday brunch, a cup of Stumptown coffee was what we needed most. 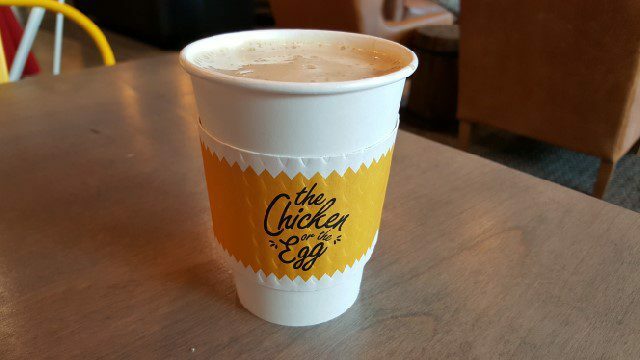 This entry was posted in Food and tagged Brunch, chicken, egg, fried chicken, Lunch, playa vista, The Chicken or The Egg by Allison Levine.